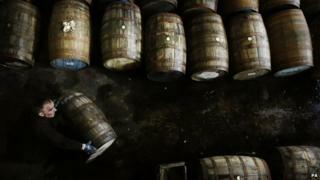 The recent rapid growth of Scotch whisky exports has stalled, according to figures for last year. The volume of Scotch exported in 2012 fell by 5%, to 1.19 billion bottles. The value grew, but by only 1%, to £4.27bn, or £135 per second - representing about a quarter of Britain's food and drink exports. Last year's figures follow a 23% increase by value in 2011 and 10% rise in 2010. The value of whisky sales has risen by 87% in 10 years. The stalled export figures for 2012 are partly explained by a shift to higher priced whisky, both premium blends and single malts. The value of single malt Scotch whisky exports has risen over the past decade by 190% to £778m. Scotch whisky exports represent about a quarter of UK food and drink overseas sales, and as big a share of Scotland's total exports. Only 7% of 2011 output went to UK sales, having nearly halved in volume since 1980. So it matters that the industry suffered a disappointing year for exports in 2012. However, that is unlikely to cause much concern among distillers. They are looking to long-term trends and investing heavily, in the expectation that new middle classes in Asia, Latin America and, increasingly, Africa, will replace declining traditional markets in the UK and eurozone. We expect to hear soon about the location of Diageo's new giant malt distillery, as part of its £1bn investment programme. Mash tuns are fermenting at full stretch, as are the coppersmiths who supply new and replacement stills. A strengthening trend within the figures is the move to premium produce, with blends moving upmarket and single malts of ever-more rarefied expressions. Distillers are more interested in extracting maximum value, which continues to grow. But a 5% drop in volume is disappointing for the Scottish economy, as that is the industry measure that drives jobs in bottling and distribution. The poorer 2012 figures are also explained by sharp declines in big key markets where customers are facing economic difficulties. In France, which imports the most Scotch whisky of any export market, the volume of sales was down 25% to 154m bottles. Value fell by 19% to £434m. At the start of 2012, France raised tax on whisky by 15%, and it is thought that influenced importers in France to boost shipments in 2011, ahead of the new tax being introduced. Spain is the fourth biggest market by volume, and its economic problems help explain a 25% drop by value to £195m. Volumes dropped by 20% to 60 million bottles. The biggest market by value remains the US. Last year, it imported £758m of Scotch - a rise of 16%. However, it saw a 2% drop in volume. The industry saw stronger growth in parts of the world which are enjoying economic growth. Latvia and Estonia were the gateways to fast-growing Russian demand, with export values up 48% and 28%. Polish sales were also up strongly, although from a lower base. Imports fell by 16% in Brazil, but Venezuela imported 12% more, with value increasing by 23% to £102m. Mexico was up 11% by volume, and 14% by value, to £92m. Shipments to Singapore - the gateway to much of east Asia, including China - were up by 7% to £339m. However, volumes increased by only 2%. Africa is now one of the brighter prospects, with 2012 exports up 7% to £239m. The strongest growth was in Nigeria, Angola, Egypt and Morocco, while the more mature South African market saw falls of 15% by volume and 2% by value. Gavin Hewitt, chief executive of the Scotch Whisky Association, said: "Scotch whisky continues to lead the way for UK food and drink exports. "A combination of successful trade negotiations, excellent marketing by producers, growing demand from mature markets, particularly the USA, and the growing middle class in emerging economies helped exports hit a record £4.3bn last year. "There is confidence in the future of the industry, illustrated by the £2bn capital investment that Scotch whisky producers have committed over the next three to four years. New distilleries have opened and older ones brought back to use to meet rising demand."